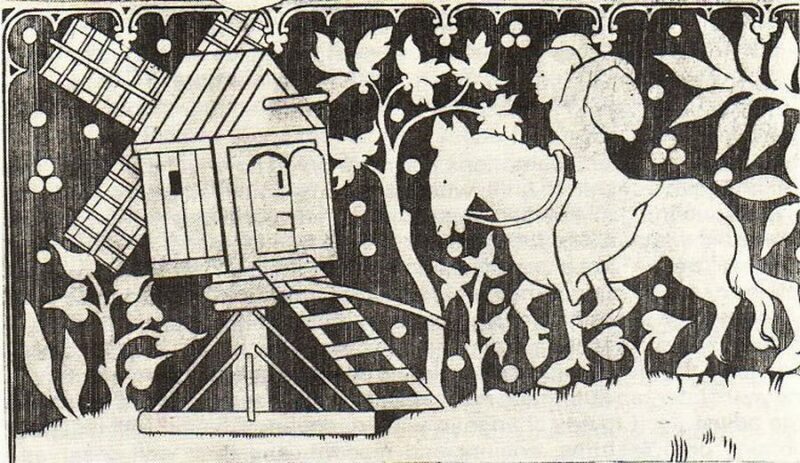 There appears to have been a windmill at the top of Mill Lane from at least the end of the 15th century. The 1501 Essesole Manor Rolls refer to a “Milbarogh” (mill barrow) in this area. Whether the barrow was a re-used barrow [burial mound] or specifically built up for the mill’s construction is not definitely known, but other burial mounds are known to have been nearby. In his will of 1548 William Boys of nearby Fredville allowed his mother to take half the profits of the wind mill, at this date a post mill, on or near the Mill Lane site. Some fifty years later Symonson’s map of Kent showed a windmill on or near the Mill Lane site,but no mills at the nearby Barfreston site. In 1626 Sir Edward Boys of Fredville settled some of his large land holdings on John Boys, his grandson, on his marriage to Margaret Miller of Wrotham. The settlement included “all that piece of land there called the Millner Downe with a wind Mill thereupon late in the tenure or occupation of John Jourdan this assign containing by estimation nine and twenty acres and two roods more or less”. Later maps of 1695 and 1736 show a mill at the top of Mill Lane, but this had disappeared by 1769, possibly because had been superseded the two Barfreston mills which seem to have started working circa 1765. In his 1933 book on Kent mills William Coles Finch wrote that he believed the old Easole post mill disappeared just after 1769. A new wooden clad brick based smock mill, which had three sets of stones, three floors and was 24 feet in diameter, appears to have replaced the old mill in the 1780′s. Circa 1890 the corn mill was re-clad with heavy duty iron sheeting which was much cheaper and more durable than the original timber boarding. By this time costs had to be kept low as this type of mill had become less profitable because most commercial flour milling was by then done by large steam powered mills which ground a much finer, purer flour and the smaller old fashioned mills mainly survived by processing local crops into animal feeds. The mill sweeps became unsafe after a severe storm in 1905 and were consequently removed and in common with many other mills at the time an oil engine was installed. 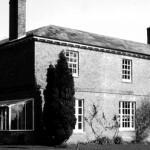 In the autumn of 1911 the mill was taken on by Edward ‘Teddy’ Gasston, the last miller at the Easole Mill, who ceased milling there in April, 1953 but he continued to live in the mill workers cottage with his sister until his death. 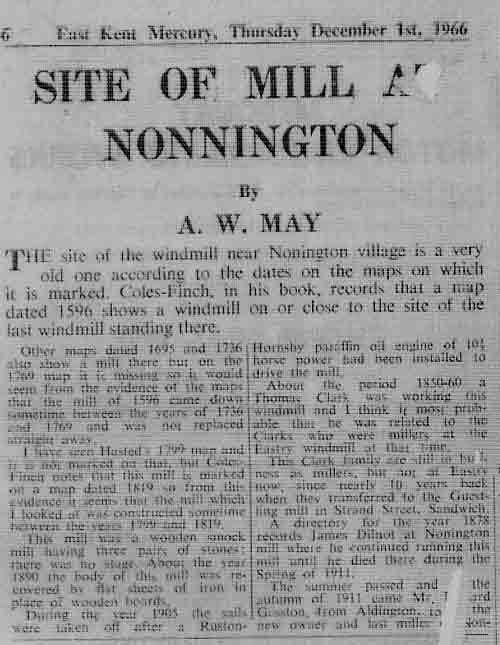 (see page 2 for Site of mill at Nonnington by A.W.May) The mill and associated buildings gradually fell into disrepair until in the early hours of Sunday 9th May of 1965, the mill, the two mill workers cottages and a large barn were severely damaged by fire and subsequently demolished (see page 2 for newspaper reports). The miller’s house survived and now much modified still stands on side of the St. Alban’s Downs road. The mill was always referred to locally as “Gasston’s Mill”, a habit which continued long after the mill had gone. 1861 James Dilnot, died in the spring of 1911. 1911-1953 Edward Gasston took over the mill in autumn of 1911 and stopped milling in April, 1953 but he continued to live in the mill workers cottage with his sister until his death. Easole Corn Mill burnt down in the early hours of Sunday, 9th May, 1965. Site of mill at Nonnington by A. W. May. 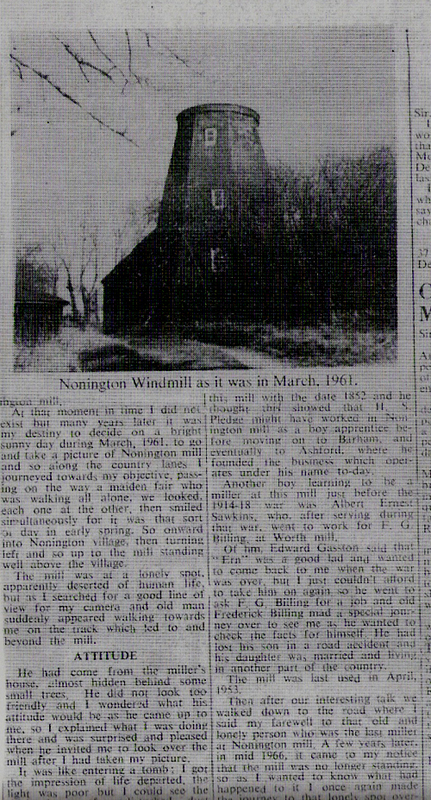 From the E. Kent Mercury Thursday, December 1st, 1966.The site of the windmill near Nonington village is a very old one according to the dates on the maps on which it is marked. Coles-Finch, in his book, records that a map dated 1596 shows a windmill on or close to the site of the last windmill standing there. Other maps dated 1695 and 1736 also show a mill there but on the 1769 map it is missing, so it would seem from the evidence of the maps that the mill of 1596 came down sometime between the years of 1736 and 1769 and was not replaced straight away.I have seen Hasted’s 1799 map and it is not marked on that, but Cole-Finch notes that this mill is marked on a map dated 1819 so from this evidence it seems that the mill which I looked at was constructed sometime between the years of 1799 and 1819. This mill was a wooden smock mill having three pairs of stones, there was no stage. About the year 1890 the body of the mill was covered in flat sheets of iron in place of the wooden boards.During the year 1905 the sails were taken off after a Ruston Hornsby paraffin oil engine of 10½ horse power had been installed to drive the mill. About the period 1850-60 a Thomas Clark was working this windmill and I think it most probable that he was related to the Clarks who were millers at the Eastry windmill at that time. He had come from the miller’s house, almost hidden behind some small trees. He did not look too friendly and I wondered what his attitude would be as he came up to me, so I explained what I was doing there and was surprised and pleased when he invited me to look over the mill after I had taken my picture.It was like entering a tomb; I got the impression of life departed, the light was so poor but I could see the…………. (rest of column lost). This mill with the date 1852 and he thought this showed that H. S. Pledge might have worked in the Nonington mill as a boy apprentice before moving on to Barham and eventually to Ashford where he founded the business which operates under his name to-day.Another boy learning to be a miller in this mill just before the 1914-18 war was Albert Ernest Sawkins, who after serving during that war, went to work for F.G. Billing at Worth mill.Of him, Edward Gasston said that “Ern” was a good lad and wanted to come back to me when the war was over, but I just couldn’t afford to take him on again so he to ask F. G. Billing for a job and old Frederick Billing made a special journey over to see me as he wanted to check the facts for himself. He had lost his son in a road accident and his daughter was married and living in another part of the country.The mill was last used in April, 1953.Then after our interesting talk we walked down the road where I said my farewell to that old and lonely person who was the last miller at Nonington mill. A few years later it came to my notice that the mill was no longer standing, so as I wanted to know what had happened to it I once again made the journey to that lonely spot…………(rest of column lost). Then after our interesting talk we walked down the road where I said my farewell to that old and lonely person who was the last miller at Nonington mill. A few years later it came to my notice that the mill was no longer standing, so as I wanted to know what had happened to it I once again made the journey to that lonely spot…………(rest of column lost). My apologies for the loss of the bottom of the columns in the second part of the item, I hope to be able to obtain a complete copy in the near future.The 1871 census records a Henry S. Pledge and family as living in Ratling Street, near to Ratling Court. Henry may have started his apprenticeship at the Easole corn mill but in 1871 he was listed as a miller employing two men and as a farmer employing two labourers and a boy. Henry Sturgess Miller was not a Nonington miller, he was the miller at the ‘Black Mill’ on Barham Downs, some two miles or so from Ratling. By the time of the 1881 census Henry had moved to Kennington, near Ashford, and taken over the running of the Wind, Steam and Water Mills at Kennington, near Ashford, Kent, with the help of his sons, Lawrence and Walter, and they went on to form H.S Pledge and Sons Ltd., the well known flour millers and corn merchants. The company ceased trading in the 1990′s.